TAMPA, Fla. - The Tampa Yankees are now the Tampa Tarpons. When the Single-A affiliate of the New York Yankees takes the field for the 2018 season, it will mark the return of Tarpons baseball to the Florida State League after a 30-year absence. The Tampa Tarpons played in the league from 1957 through 1987, winning titles in 1957 and 1961. "We have great fans in Tampa," noted Vance Smith, Tarpons general manager. "This is Tampa's team, and this name and brand identity honor the community and celebrate Tampa's rich baseball history." Tampa has hosted spring training for more than 100 years, beginning in 1913. It has been the spring training home of seven major league teams, including the Yankees. Tampa has also been a minor league baseball town since 1919, when the Tampa Smokers were a charter franchise in the original Florida State League. Noteworthy players with Tampa roots include Hall of Fame catcher and manager Al Lopez-the first Tampa-area native to play and manage in the major leagues and be inducted into the Baseball Hall of Fame-Tony LaRussa, Wade Boggs, Lou Piniella, Tino Martinez, Gary Sheffield, Dwight Gooden and Fred McGriff. Assistant general manager Matt Gess says this is about more than making a splash. "The Tarpons name gives us the opportunity to connect with our fans and reconnect with Tampa's baseball heritage," Gess said. Known for their fighting spirit when hooked, tarpons are one of the most prized catches for anglers who fish Florida's Gulf Coast seeking to land one of the titans of saltwater sport fishing. The principal team colors of the new identity are Legends Navy, Tarpon Silver and Gulf Blue. The comprehensive brand system, developed by Studio Simon, features a primary logo that was inspired by previous iterations of Tampa Tarpon logos. The club is scheduled to unveil their new caps and uniforms in January. 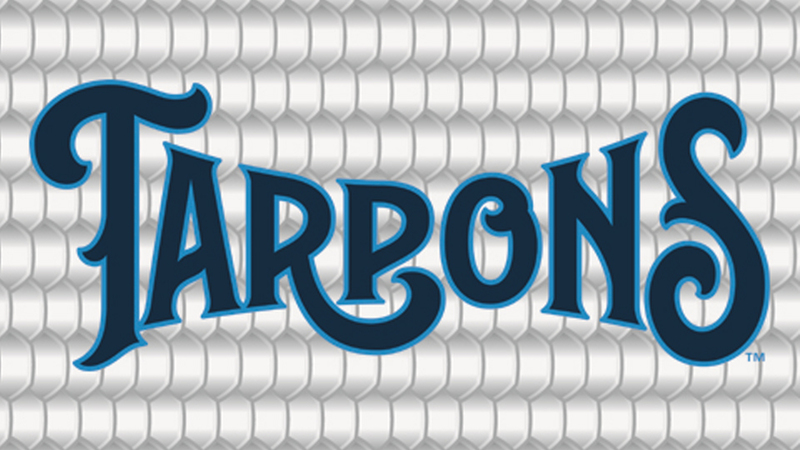 Merchandise featuring the Tarpons' logo is now available at www.tarponsbaseball.com. For more information, call (813) 673-3055 or visit www.tarponsbaseball.com.